Brand New Film and Education resource for 2019. Purchase this exciting new pack HERE. Out of Site, (Welsh Version) Education Pack aimed at tackling racism towards Gypsy, Roma and Travellers. For pack materials click HERE. Immigration - Whats the Story?Guidance notes to support teachers in discussions about the issue of immigration with young people in association with the campaign's educational film 'Immigration; What's the Story'. GRT Toolkit, (Welsh Version) An educational Toolkit for teachers and practitioners working with GRT young people in Wales. Guidance for Initial Teacher Trainers This resource is designed to be an accessible guide, packed with advice and activities that will help institutions to prepare student teachers to tackle racism and promote equality in the classroom. A Safe Place, (Welsh Version) Education pack which accompanies the education film in 2008. Aimed at combating the myths against Asylum Seekers . Homophobia: Let's Tackle It, Education pack aimed at challenging homophobia and homophobic bullying. For pack materials click HERE. 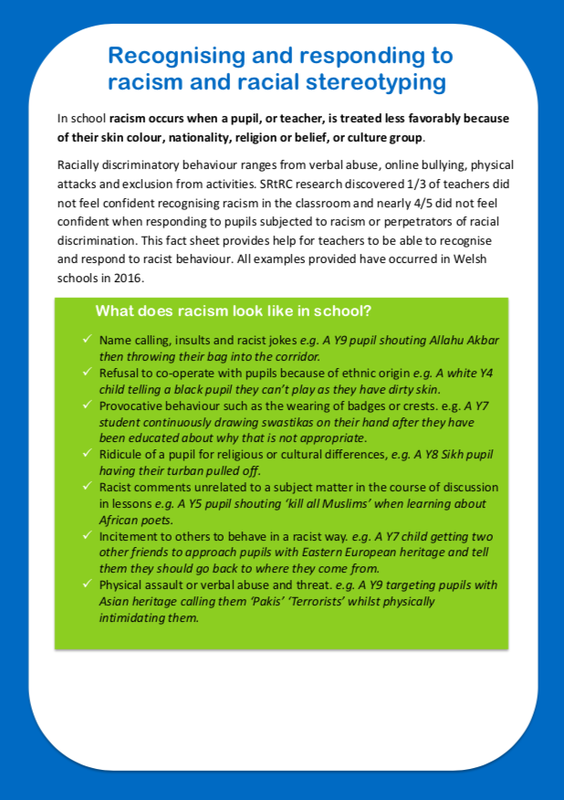 Tackling racism in school factsheets (Wales) - These factsheets feature a range of brief guides to appropriate terminology, equality duties, and identifying and reporting a racist incident in schools in Wales. Reflecting on your school's culture and environment - Guidelines to help teachers evaluate the current culture and environment of the school with reflective questions to aid in staff training and discussions. 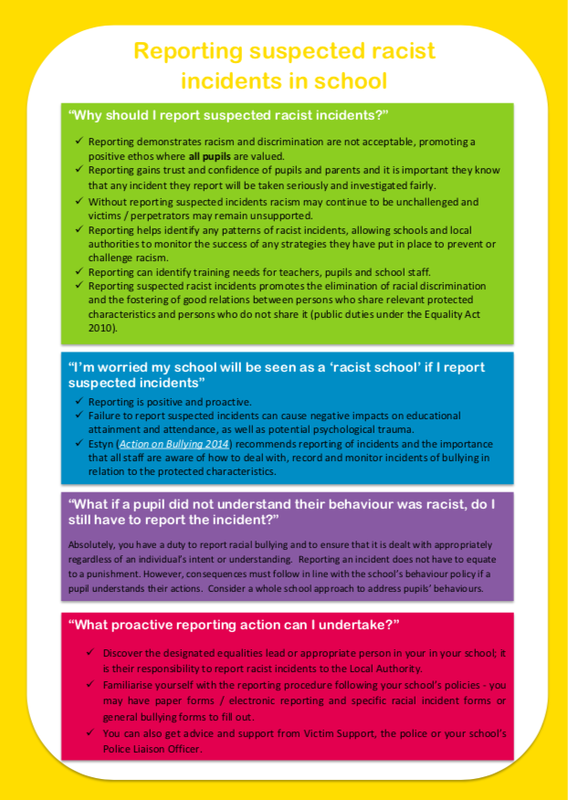 Reporting suspected racist incidents in school: A guide for parents - This guide highlights the duty of care that schools have in dealing with incidents and provides advice of what measures parents can take if positive action has not been taken by the school. 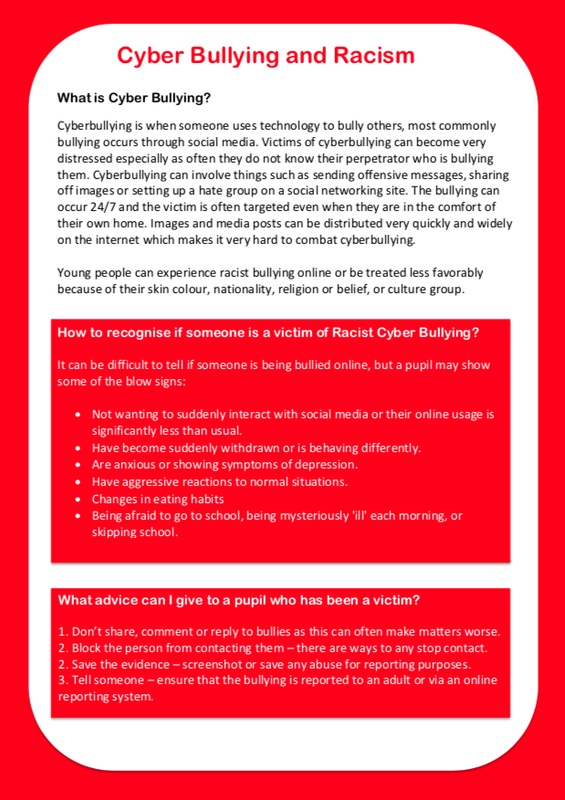 Cyber bullying and racism - This factsheet provides and Introduction to cyber bullying, steps on how to recognise if someone is a victim of racist cyber bullying and advice for teachers to provide to pupils. Equality Act 2010 - Introduction to the Equality Act 2010. (Welsh). Responding to racism Action plan template - Template for responding to and dealing with racism in school. Simple Acts: a brilliant campaign from Refugee Week, full of practical suggestions of actions young people can undertake. Terminology Guidance - Adapted from We’re all white, thanks: the persisting myth about ‘white’ schools by Chris Gaine. These are only a few of the many excellent teaching aids available: please email info@theredcard.org if you have any specific suggestions or recommendations for inclusion below.